Like most companies, Atlassian has a mixture of people who are working from home full-time (like me) and those who grab an ad-hoc day when the plumber is coming or they can’t stop sneezing. But our collective WFH muscles got a major workout recently when 500 of us went remote during the week-long gap between moving out of one office space and into another. I talked to colleagues in several departments at Atlassian and dug into my own bag of tricks to bring you this collection of tips for working from home. And because working from home came with a few surprises, I’ll also share some little-known facts and a classic blooper – don’t miss these if you’re thinking of transitioning to full-time remote work. Yes, this tip is at the top of every other list of working from home tips you’ve ever read. There’s a reason for that. When you work from an office, your commute helps your brain shift into “work mode”. At home, you can create that same mental shift by dedicating a spot for working. “I have a separate desk at home that is pretty much only used for work,” says Miles, a marketing manager. 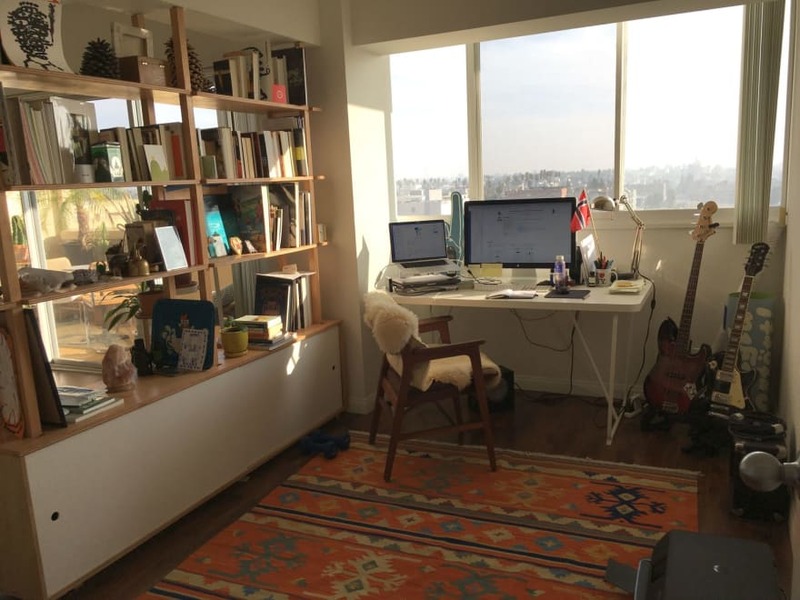 “This helps me focus because I think of that area as a mini office.” If you’re short on space and have to use your couch or kitchen table, no worries. Just be consistent. Trick out your home office space on the cheap, with the help of flea markets and a bit of DIY ingenuity. Don’t just stop once you’ve acquired a desk, though. Give your space some personality with wall art, framed photos, a desk lamp to die for, or an essential oil diffuser if that’s your jam. Y’know how running to the office kitchen to refill your coffee “real quick-like” typically results in a 10-minute hallway convo about your big new project? I didn’t understand the value of interludes like that until I went remote. At first, I would blast through my tasks for the week in about three days because there were so few interruptions. Sounds great, except I’d be completely out of gas by Thursday. And Fridays were, umm, less than productive. Your work week is a marathon – not a sprint. I quickly learned to sprinkle a few 5-10 minute pace breaks throughout the day, away from my desk if possible. For my teammate Claire, her furry friend makes all the difference. “I take my dog for a walk before I start work, at lunch, early afternoon, and after I’m done for the day. It’s a great mental break.” Not to mention healthy. Do ten push-ups or hold yourself in plank pose. Pick up your guitar. Make your grocery list. Your stamina (and your team) will thank you. While some people (me included) absolutely love working from home, others love the idea of working from home… only to find the reality doesn’t suit them. And that’s ok. “It’s tough to get started, and it’s tough to set things aside when I’m done for the day,” says Jim, a developer on the Bitbucket team. “I also feel isolated from the rest of the team.” That’s a common sentiment, so don’t be afraid to own it. If transferring back into an office isn’t an option, self-awareness will help you find your WFH groove. Develop some strategies for staying connected to your team and understand what will help you focus vs. what will distract you. Have an open, on-going dialog with your team and check in with yourself regularly. Conversely, if you love working from home, take the time to reflect on why and make the most of those aspects. Regardless of who pays, the logistics are on you. If your lunch game involves anything more complicated than warming up last night’s leftovers, you’ll need to build prep and clean-up time into your workday routine. For maximum efficiency, pick up a full week’s worth of supplies each Monday morning (unless a daily walk to the store is your pace break of choice). Choose brain-boosting superfoods like almonds, broccoli, berries, beans, eggs, and salmon. Remember, working from home tends to be more sedentary than office-based work, so skip the Oreos. 6:00 – Wake up, brush teeth, exercise. 7:00 – Get kids up, brew coffee, shower, get dressed (including hair and make-up), unload the dishwasher, help my daughter do her hair, curse at the stray Legos I inevitably step on. 8:00 – Take my son to preschool. Rituals allow us to make transitions with minimal mental and emotional turbulence. Yours might be totally mundane like mine, or you might mix it up by working for an hour before you shower and dress. The important thing is to find a routine that works for you and step through it consistently. “The routine of physically getting ready for work is one of the most important things I did to make my week of working from home productive”, says Cameron, who leads an engineering group of more 250 people. Many of us have scars from struggling with video calls in years past – the struggle was real. That may explain why people new to working from home, and their teammates in the office, are often skittish about vid chat. The good news is that now you can jump into a video call in a matter of seconds using Skype, Google Hangouts, Zoom, BlueJeans, or similar services. “Being comfortable with quick video chats saves a lot of time compared to trading emails or instant messages,” says dev tools marketer Alyss. That face-to-face interaction also does wonders in terms of building relationships with co-workers. However, be prepared to coach your co-workers a little as they learn to embrace the impromptu video call. Their instinct will be to go find an empty conference room, which just wastes time. If you walked over to their desk in person, you’d have the conversation right there and been done in under a minute. Nobody would think twice about distracting people at neighboring desks because ambient noise is just part of being in an office. Video calls should be treated the same way. Once my teammates got accustomed to that idea, it made working as a distributed team a lot easier. Although I felt I’d done my homework before going remote, there was still a lot to learn. If you’re considering going fully remote, take these tid-bits into account. There’s a good chance your boss would rather keep you on as a remote worker than replace you. Recruiting, interviewing, and onboarding new employees is a lot of overhead. Many managers feel having an established teammate go remote is far less disruptive on the whole – especially if you’re crushing it lately. Supporting remote employees is not trivial from an HR and tax perspective. In the U.S., a company must have a tax entity set up in every state in which they have a full-time employee. For this reason, many companies restrict full-time remote work to states where they already have offices. Benefits administration gets complicated because many insurance carriers operate regionally instead of nationally. And it’s just good business sense to adjust remote employees’ salaries to be in line with where they’re living. Figuring all this out takes time away from work HR could be doing that might benefit more people. So if you meet resistance from your employer about going remote, don’t assume they’re trying to be evil. They’re probably trying to be practical. There are hidden costs to remote work. You’ll need the fastest, strongest internet connection money can buy. 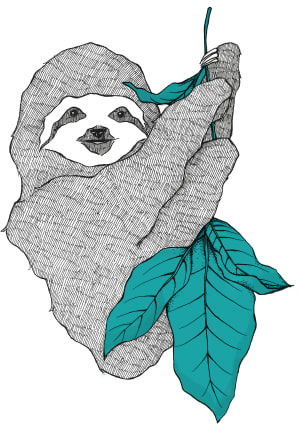 You’ll be paying for (and taking the time to procure) all your coffee, snacks, and meals. Your utility bill will go up because you’re no longer tuning the heat and/or air conditioning down during the day and you’re keeping more lights on. For most people, however, these new costs will be offset by the fact that you’re not gassing up the car or paying bus fare as often. Sharing a workspace with a roommate or partner feels less isolated, but has its own challenges. My husband works remotely too, and when we moved, we made sure to buy a home with an office we can share. It was a great way to start the transition to remote work. Soon, however, he was working almost exclusively from his recliner. We could never agree on what temperature the room should be, and we both tend to be vocal participants in meetings. So now we work in separate rooms and send chat messages to each other even though we’re 50 feet apart. Which is kind of pathetic, but there it is. Extroverts actually do quite well as remote workers. The key to staying in the loop and feeling connected when you’re the one remote member of your team is initiating communication. ABC, baby – always be communicating. We extroverts tend to do this instinctively anyway. Interpersonal interaction is our default setting. So we get a “two birds, one stone” synergy bonus. Getting everyone to take the meeting via video is kind of awesome. When only one person joins remotely, it’s easy to (unintentionally) leave them out of the discussion and harder for them to contribute. But when everyone dials in, even if it’s from their desk at the office, we’re all in the same boat and on our best behavior. We raise our hands to speak. We wait until the other person is done talking before chiming in. We’re less likely to let one person dominate the conversation. 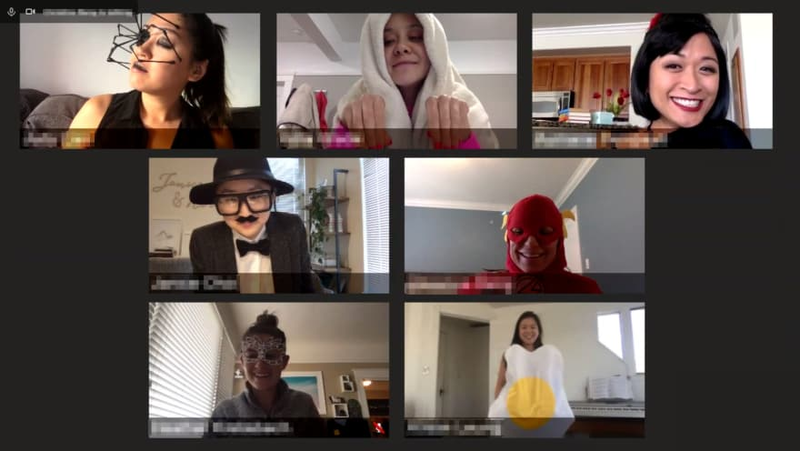 All-remote meetings + Halloween = good times. Besides: you know who enjoys being the one giant head on the TV during meetings? Nobody. Although I’d love to tell you the WFH week was universally loved, it wasn’t. Max from marketing said it was “only the best week ever”, while Mary, a product owner, missed the higher level of social interaction and felt like the week was something she “just had to get through”. For others, it was a big empathy-builder. “Be mindful of our remote colleagues and how easy it is for them to feel (or be) left out,” says Adam from technical account management. Your experience working from home will involve plenty of twists, turns, fails, and wins. Be patient as you and your team adjust, expect the unexpected, and just roll with it. At least you can rest easy knowing you won’t be the first remote worker whose toddler makes an unplanned cameo on international television. This article appeared first on the Atlassian Blog. When passion meets purpose, great things happen. We're doing the best work of our lives – but we can't do it without you.